Home Mercedes Benz E-Class How does an E-Class Cabriolet get on top of the world? By helicopter! How does a Mercedes-Benz get on top of the world, since you can call it anything but an off-road vehicle? Mercedes had a mission next to impossible. To bring the E-Class Cabriolet variant on top of Mont Blanc. So the only way up was by helicopter! The Stuttgart grand brand selected a very special location for a very special car. 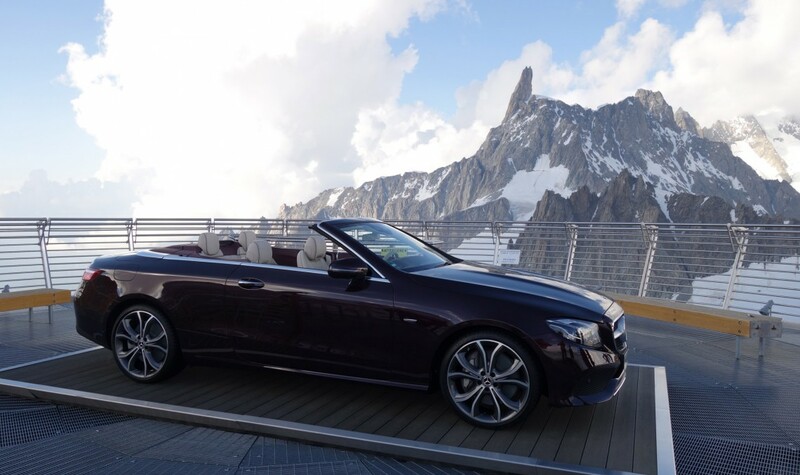 For the presentation of the Mercedes-Benz E-Class Cabriolet, there was no way that they could push the convertible E onto the snow-covered slopes of the Mont Blanc massif, to the top station of Punta Helbronner, known as the Eagles Nest. In order to complete the mission, the car maker hired a helicopter to carry the precious load all the way to the top. They tied the almost 2-ton vehicle carefully and lifted it into the air. And they had to ship it extremely quickly: the weather in the Alps is very unpredictable. It was sunny and bright when they took off, but the sky was soon covered by clouds and the helicopter pilot couldn’t even see the car hanging down from the aircraft. The Heliswiss crew completed their mission though and the E-Class Cabriolet landed safely at over 3,400-meter altitude (over 11,000 feet), close to the very top of the mountain.